Outgoing and returning SonarVision waves are illustrated as Senior Visioneer Brian Bushway clicks to gauge his surroundings in this animation from CNN’s “Vital Signs”. Recent studies have shown that the brains of people who have been blind since birth or an early age rewire themselves to adapt to the loss of a sensory ability. As Science Daily reported, “The brains of those who are born blind make new connections in the absence of visual information, resulting in enhanced, compensatory abilities such as a heightened sense of hearing, smell and touch, as well as cognitive functions (such as memory and language) according to a new study led by Massachusetts Eye and Ear researchers. The report, published online in PLOS One, describes for the first time the combined structural, functional and anatomical changes in the brain evident in those born with blindness that are not present in normally sighted people. Through our research partnerships over the years, we have learned that it is necessary for the brain to be “trained” or repeatedly stimulated over time to activate this rewiring. We’ve previously discovered that the echoes from our specialized echolocation tongue clicks that we call Flashsonar- like flashes or pulses of light – activate, or “light up” the Visual Cortex – the part of the brain normally involved in processing sight that people presume goes dormant in a blind person. It’s part of our process that we call “Visioneering”, where we augment the brain training and Visual Cortex activation with full-length Perception Cane training using longer than traditional blind navigation canes to provide additional perceptual context, all of which combines to produce a sort of fuzzy 3D spatial geometry that we call SonarVision – “seeing with sound”. Once developed, this image or spatial understanding is a very powerful addition to a blind person’s travel competence and to fostering feelings of confidence about making friends and participating in social activities. FlashSonar training inspired the phrase ‘Our Vision is Sound’, which is what many of our students use to simply explain their awareness and deep connection with the world. I have heard that not everyone can learn SonarVision and that some people are just born with the ability. Is that true? All humans are born with the ability to use SonarVision if they can hear. Sighted people can even learn basic levels of SonarVision perception within minutes of guided exercises. The trick is training the brain to know what to listen for and to know how to process that information. People around the world of all different ages and backgrounds have learned SonarVision and use it to be more efficient at self-orientation in new places. The common factor for success among our students is their motivation for a better life experience and their frequent opportunity to practice and apply the skills. Why teach active instead of passive echolocation? We teach the active click for a number of reasons. First, active echolocation gives control to the user to acquire a vast amount of information in any location at any time. Biosonar scientists refer to active echo calls as “interrogating the environment”. Indeed, we often explain to our students that they are using an echo language to converse with the environment. By strategically clicking, we ask the questions, “Where are you” and “What are you”, and surfaces throughout the environment answer these questions for those who understand the language of echoes. Secondly, the process of actively clicking give a blind person more control and thus empowers the development of internal attitudes such as confidence, maturity and the ability to socially engage all people. These internal qualities are very important for navigating everything in life, from school to work to romance. Scientists at Ludwig Maximilian University of Munich prepare to scan Daniel Kish’s brain responses to pre-recorded FlashSonar echoes. What do you mean by “Perceptual Navigation” and “Perceptual Freedom”? Our overall approach to instruction is called ‘Perceptual Navigation’, because it is evidence-based, and founded in perceptual theory and neural science. We define Perceptual Navigation as: “Engaging the whole brain in a developmentally natural manner that activates the perceptual imaging system by fostering self-directed freedom of discovery. We go beyond teaching a collection of skills to address various situations. We actually teach the brain to perceive and respond more effectively to any environment in any situation. Recent studies have proven that the brains in people born blind rewire themselves over time to adapt to the condition, but it takes active engagement. And our research partnerships with various universities and research centers have shown how the echoes from our FlashSonar echolocation clicks activate the Visual Cortex, the part of the brain normally used in seeing. Read more about our latest study, co-authored by Lead Visioneer Daniel Kish. Once students have mastered this and other self-directed skills, we then feel they have achieved ‘Perceptual Freedom’ by becoming more independent via self-direction and have liberated themselves from the cycles of dependency and isolation. Most O&M Specialists are trained to teach their students a collection of skills that the student learns to match to specified situations. While we do teach some of these skills, our emphasis is on developing the perceptual system to construct its own method of addressing any situation as it occurs. What are the advantages of having mobility coaches who are blind themselves? The advantages of having blind mobility coaches are that they can often better relate to the clients and share the “street smarts” that it takes to navigate the public. While not every blind person is cut out to be an instructor, just as every sighted person isn’t, blind instructors give the opportunity to infuse the instructional process with the blindness perspective. It is one thing to know “about” blindness, as many sighted people may through their own training and experiences, but it is quite another to “know” blindness by actually being blind and living with blindness every second of every day. How does FlashSonar change the lives of the blind people who use it? Lead Visioneer Daniel Kish and Medploy Kittisiripan, one of the blind trainee Visioneers in Thailand, help young Chelsea refine his click. Photo by Warawat Bibb Sabhavasu. Those who use FlashSonar are more aware and engaged in what is going on around them. They develop a confidence that makes it easier for them to participate in school, work, and social activities, which leads to a life richer with experience and enjoyment. They often exhibit more erect posture and proper head placement, which helps to present a more engaged and self assured demeanor to others. Won’t clicking my tongue make me look funny or draw attention? The method of tongue clicking that we teach and advocate is done discretely, and is no louder than the situation requires. Clicking the tongue doesn’t look nearly as funny as notbeing aware, looking lost and confused, getting turned around and crashing into things if FlashSonar isn’t used well. In our extensive experience, it is the blind people that sometimes seem to be concerned about this. Most sighted people don’t seem to pay enough attention to the subtle sounds of the tongue clicking to even notice. A person that travels with a full-length white cane draws much more attention from greater distances than the sound of the tongue click. Asking a person not to use FlashSonar is like asking a sighted person to walk around with their eyes half closed. We already have an O&M instructor. Why would we need additional services? -Is the student being prepared to navigate any environment freely and naturally, with little need to rely on others? -Can the student participate equitably in all aspects of the community, or is he or she relegated to the side lines? -Can the student move fluidly and comfortably around without awkwardness? -Does the student interact with the environment and other people in a manner comparable to his or her peers? -Are the student’s activities overly structured or regimented? Many students and families are disappointed with the quality of instruction they are receiving. Or, they are simply interested, often with the enthusiastic cooperation of their O&M instructor, in receiving more specialized training in perceptual development. Traditional O&M instructors usually do not know how to teach FlashSonar. They rarely receive more than part of one lecture or half a textbook chapter on echolocation. What is the No Limits approach? Our “No Limits” approach is the attitude from which our Perceptual Mobility Instructors and Coaches operate and develop in our students. We create space and opportunity for our clients to discover new abilities and ways of participating in life. It is not up to us as instructors to decide and limit the type of things that our students want to learn how to do better. We help our clients achieve their dreams by fostering within the individual the capacity and confidence to adapt any situation to make it work for them. Lead Visioneer Daniel Kish introduces 18 month-old little Ran to FlashSonar Visioneering and her Perception Cane. You may have read about our advocacy on behalf of Lily-Grace, the young blind girl bullied out of her school in the U.K. because they didn’t want her using her full-length Perception Cane due to an ill-informed Risk Assessment. Part of that advocacy involved media coverage of Lead Visioneer Daniel Kish providing expert insight into the benefits of full-length cane training at younger ages based on years of academic and scientific research. Visioneers.Org is a division of World Access for the Blind, our 501(c)(3) Non-Profit organization registered in the State of California. Since the year 2000, our Mission has been to facilitate the self-directed growth and achievement of persons with any form of blindness at any age, and to increase public awareness about the strengths and capabilities of blind people across the United States and around the world. In 2018 we were named an Innovative Practice by the Zero Project at UN Headquarters in Vienna. 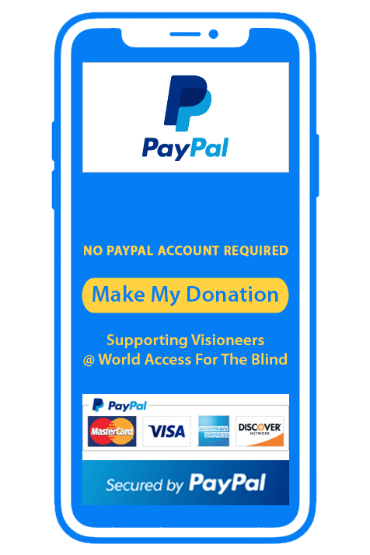 Visioneers.Org | World Access for the Blind strive to improve the quality of interaction between blind and sighted people by facilitating equal access to the world’s resources and opportunities. We are interested in more than meeting the minimum requirements for functioning and life satisfaction. We believe in mutual respect, consideration, and accommodation of blind and sighted people by society. We expect to see the blind population, en masse, rise to levels of productive participation and achievement to compare with those of sighted people. Read more about our recent work in Thailand teaching FlashSonar™ to blind navigation coaches to prepare them for instructing other blind people there. We have developed and demonstrate a modern, holistic approach to blind movement and navigation that we call Perceptual Navigation, which greatly improves upon traditional methods and paradigms. This more modern approach draws from cutting edge science of human perception and action. It is based on a philosophy of No Limits, and on a new paradigm of self-directed discovery and freedom first. We are pioneering a new approach to delivering these strategies more broadly and economically. We are also helping to mobilize resources, facilitate collaborations, and provide specialized expertise in nonvisual human perception to guide and focus the development of more effective, respectful, and forward thinking strategies and technologies to expand nonvisual capabilities. Finally, we have been executing a global public awareness campaign to bring to the attention of the general public, at all levels, the true challenges faced by blind people, as well as the true strengths, achievements, and capabilities possible for blind people. Visioneers.Org | World Access For The Blind supports the idea that blindness is not as disabling as is commonly believed. Barriers to functioning associated with blindness arise more from unproductive interaction between blind people and society than from intrinsic deficiency. While everyone faces limits, we have been asserting our “No Limits” philosophy since the year 2000 that limits should not be imposed or presumed upon anyone. We all, blind or not, should enjoy the freedom and strength of character to seek and discover our own limits and strengths. Blind people possess the same needs as everyone else – to be free from undue restriction, to be capable and competent, to know a sense of camaraderie and belonging to the world, and to respect themselves and draw the respect of others. They hold the same ambitions and dreams as others, and are nourished by the same hope and assurance that they can achieve these aspirations. Blind people can achieve the same quality of life as sighted people when they gain the same freedom to access the world as sighted people.